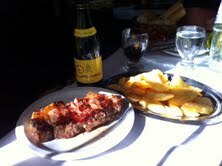 There is much for the discerning traveller to eat and drink Buenos Aires, and not all of it is good. Let’s start off with the nicer and more palatable, ending with the not-so-good. It’s all very subjective, of course – one man’s meat etc. On a recent trip to Argentina, we spent much of our visit in the company of our friend Marcelo, a local, well versed in the city’s food culture and more than familiar with our desire to seek out that which exists beyond the numerous fast food joints. Beef and Buenos Aires go hand in hoof, so our man in BA had arranged lunch at one of the city’s best known, and most highly regarded steakhouses, or parillas. La Brigada, in the ‘atmospheric’ (slightly scary) San Telmo district was our destination. Located on the other side of town from our hotel, a taxi would have been too expensive so we took a bus, happy in the knowledge that our friend was well versed in the city’s public transport system. It turns out that even a BA native can find it difficult to get to grips with easily getting around the sprawling metropolis – suffice to say, we arrived at La Brigada long after the hour which our table was booked for. So long after that lunchtime service had nearly finished and there were now plenty of tables available. Various cuts of cattle were ordered and eaten, the delights of chimichurri steak sauce were discussed and another box was ticked by the intrepid worldinaglass team. You may argue that a steak’s a steak, but unless you’ve eaten the best cut of the best meat in the best restaurant in the best city of the best country for beef in the world, your opinion is worthless. Speaking of worthless opinions, here’s my two pesos worth on the flipside of the country’s meat and drink. Having extolled the virtues of Chile’s national drink – the pisco sour – elsewhere on this blog, I feel that some balance is required when it comes to Argentina’s national drink, Fernet Branca. Throughout our stay, Marcelo had been urging us to try this digestif at every opportunity with the assurance that it was, mixed with Coca Cola, a truly delicious concoction. We came close, on many occasions, but inevitably succumbed to further pisco sours which, to be fair, were even nicer than their Chilean counterpart as the Argentinean recipe tends to omit raw egg white. And to push the point even further, Coelho goes on to say “Accept what life offers you and try to drink from every cup. All wines should be tasted; some should only be sipped, but with others, drink the whole bottle.” A clunky metaphor maybe, but somehow appropriate in this case. It’s impossible to avoid the inevitable – I said that. It wasn’t until I had reached the business lounge at Buenos Aires airport on the day of our departure that I finally accepted that a nettle had to be grasped and a bull had to be taken firmly by the horns. I poured myself a Fernet Branca, topped it up with Coke and took a sip. One, never, ever to be repeated, sip.